Thrive Agric | Beats by Rice: Welcome to the Beauty Studio by Rice. Beats by Rice: Welcome to the Beauty Studio by Rice. “For the ladies and also for the interested gentlemen, here’s something you never knew about rice and rice water. Rice water can make you glow and look peng”. Rice is the most important food in major part of the world. It is the world most consumed food. 11,000 metric tons demanded in Nigeria daily, with over 5 tons produced per hectare producing over 20 bags of 50 Kg rice. Oh! yes, aside these Agroeconomics and profits of rice which are good reasons for you to own a rice farm today with THRIVE , there are also other interesting beauty benefits of rice. For the ladies and also for the interested gentlemen, here’s something interesting you never knew about rice and rice water. Rice water can make you glow and look peng. In China, Japan, and Southeast Asia, Ladies have utilized rice water as a hair treatment for ages but does rice water have any experimentally demonstrated magnificence benefits? In the Far East, the therapeutic estimation of rice was referred to as far back as in 2,800 BC, when it was utilized by imperial doctors for mending purposes. It was accepted to re-establish serenity and peace to the individuals who were effectively disturbed. Records from this period additionally demonstrate that rice was utilized for hair and skincare. The ladies of the imperial court in Heian Japan developed their hair to the extent that this would be possible. Their wonderful long hair, called “suberakashi”, came to the floor and was worn straight out their backs in a sparkling sheet of dark tresses (called kurokami). These court women were said to have brushed their hair every day utilizing Yu-Su-Ru, which is the flush water got from the washing of rice. Well for reasons unknown they were onto something as late research has demonstrated that Yu-Su-Ru extricates show hair mind impacts, for example, lessening surface friction and expanding the hair elasticity (Inamasu et al., 2010). Rice water is the starchy water left over after rice is cooked or left to soak. Rice grains contain 75– 80 percent starch. Rice water is thought to contain a significant number of the vitamins and minerals contained in rice. Some active compounds in rice have been broadly used as cancer prevention agents in most healthy skin products. Rice grain contains phytic corrosive which peels and builds blood stream to your skin. Rice can be used externally as powder or poultice. Rice flour, cleaned thickly on your skin’s surface, has an extremely cooling and relieving effect on your skin especially with burns. Rice water is recommended by Ayurvedic experts as a powerful balm to chill excited skin surfaces (Umadevi et al., 2012). It is also worth saying that rice water usage aren’t an exclusive arrangement restricted to those on the mainland of Asia, despite the fact that the methods begun and were intensely utilized amid the Heian period. A more recent likeness to this story can be found in China. The Yao ladies, who live in a town called Huangluo in China, are renowned worldwide for having hair that midpoints 6 feet long. The Yao ladies credit the length and shade of their hair to the reality that they bathe it in rice water. SO THIS IS JUST A TRADITIONAL METHOD AND NO SCIENTIFIC BACKING? Well, it’s a traditional method with scientific applications especially in product developments. The amino acids exhibit in rice water, specifically, help in the recovery of hair and help quicker development of your hair. Likewise, rice water contains vitamins B, C, and E, which additionally help in hair development (7). The most ideal approach to utilize rice water to develop hair is to flush your hair with it after a wash. THE SCIENCE OF RICE WATER AND FERMENTED RICE WATER. Rice water sounds like a seemingly simple entity. But it has a few variations, of which plain rice water and fermented rice water are better known. Let’s figure out which one is better. Plain rice water’s pH is higher than your hair’s pH (5). Fermentation brings down the pH levels of the rice water to that of your hair and helps close the cuticles, thereby protecting the hair. Fermenting rice water enhances the existing vitamins and nutrients levels in it, which nourish your hair follicles. It promotes healthy hair growth and improves the overall condition of your hair. Also, during fermentation, a substance called ‘pitera’ forms in the rice water, and it is rich in vitamins, minerals, amino acids, and organic acids. Pitera is known to promote cell regeneration and keep your skin and hair healthy (6). 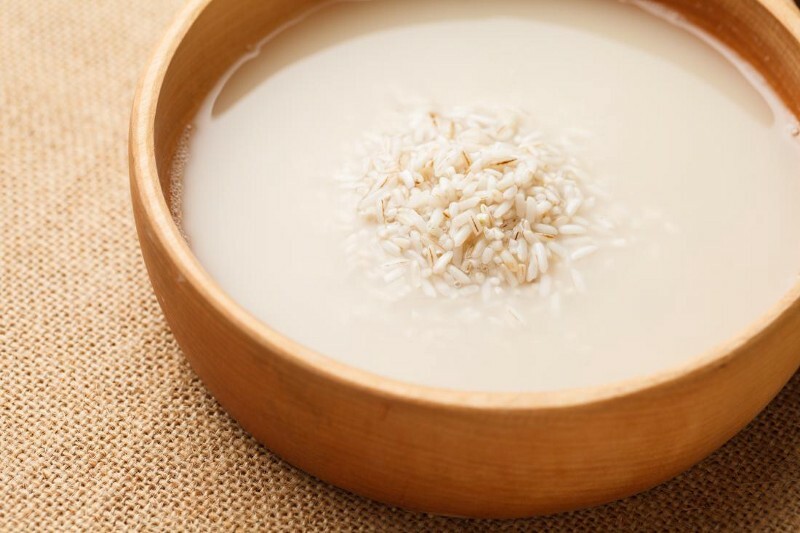 Fermented rice water is acidic, and when you rinse your hair with it, it restores and balances the pH of your hair. 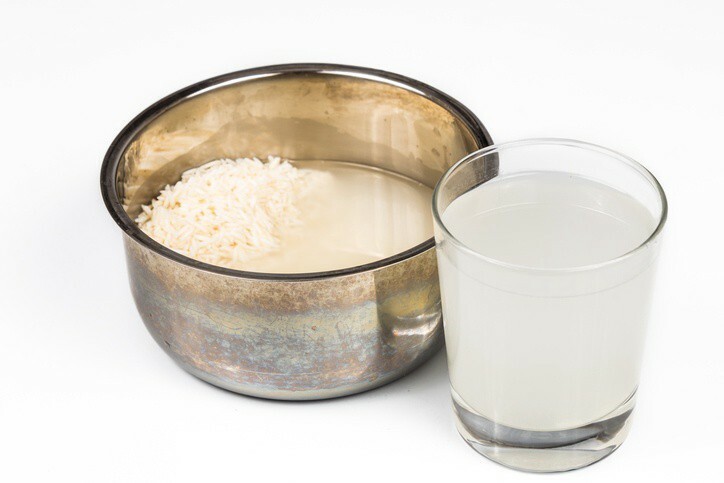 Fermented rice water enhances the benefits of plain rice water, and you can use either of them depending on the level of repair and rejuvenation you need. Now, it’s finally time to learn how to make it, my friend. Excited? HOW TO GET THE RICE WATER. One way of obtaining rice water is by boiling the rice. The excess water left after cooking rice in water is called boiled rice water. It is a concentrated liquid that you can dilute to use as a face wash or a hair rinse. Fermented rice water is rice water that is left to ferment for a day or two before use. Fermentation turns the rice water into a potent liquid that needs to be diluted before use. Lately, Beauty and cosmetic sites and product developers have gotten on to this tradition. Presently, the rice water trend is spreading. And you’ve got it all, so go and glow.